The group includes Serbian Americans living in the United States for one or several generations, dual Serbian–American citizens, or any other Serbian Americans who consider themselves to be affiliated to both cultures or countries. Serbian Americans fought in the American Civil War, primarily on the side of the Confederacy, as most Serbs living in America were in Louisiana and Mississippi. Several Confederate military units were formed by Serbs in Louisiana, such as the Cognevich Company (named for Stjepan Kojnevic, who immigrated to Louisiana in the 1830s), and the First and Second Slavonian Rifles. At least 400 Serbs fought in these three units during the Civil War. Several other known Serbian soldiers in the Civil War came from Alabama and Florida, specifically from Pensacola. Serbian-Americans volunteered in the First Balkan War. During World War I, as many as 15,000 Serbian-American volunteers returned to the Balkans to fight for the Allied cause in their homeland. Serbs in the United States who did not volunteer to fight marched for the creation of Yugoslavia, sent aid to the Balkans through the Red Cross, formed a Serbian Relief Committee, and urged notable Americans to support the Serbian cause. Serbs (and Montenegrins) have lived in Alaska since the earliest days of American settlement in the 19th century. Many Serbs came in the Klondike Gold Rush in the late 1890s to seek fortune, just like they had done in the earlier California Gold Rush. The primary areas of Serbian and Montenegrin settlement were Juneau, Fairbanks, and Sitka. Many Serbs settled in the Canadian Yukon during the gold rush as well, such as legendary prospector Black Mike Vojnić. 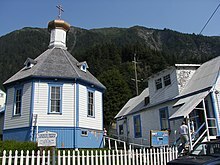 The St. Nicholas Orthodox Church in Juneau, which was built by Serbs and Tlingit natives. Number of declared Americans of "Serbian ancestry"
For a more comprehensive list, see List of Serbian Americans. Embassy of Serbia, Washington, D.C.
Charles Simic and Dejan Stojanovic are notable poets. Walt Bogdanich (1950) is an investigative journalist. He won the Pulitzer Prize for Specialized Reporting in 1985, the Pulitzer Prize for National Reporting in 2005 and the Pulitzer Prize for Investigative Reporting in 2008. Bogdanich led the team that won the 2008 Gerald Loeb Award for their story "Toxic pipeline". Branko Mikasinovich is a scholar of literature as well as a noted Slavist and journalist. He has appeared as a panelist on Yugoslav press on ABC's "Press International" in Chicago and PBS's "International Dateline" in New Orleans. Alex N. Dragnich is the recipient of the Thomas Jefferson Award for distinguished service to Vanderbilt University, and he is author of numerous books on Serbian/Yugoslav history. Brad Dexter plays Senator East, who gives a Serbian lecture in the 1975 film Shampoo. Craig Wasson plays a Serbian American, "Danilo Prozor", in the 1981 film Four Friends. In the film, Danilo has conflicts with his father, his struggle with his heritage, his lingering relationship with a girlfriend, and his thwarted marriage to a Long Island debutante. Sam Rockwell plays a Serbian-American boxer, "Pero Mahalovic", in the 2002 film Welcome to Collinwood. Tom Cruise plays a Serbian American, "Stefan Djordjevic", in the film All the Right Moves. George Clooney's film Good Night and Good Luck, is based on the events surrounding the discharging of American Serb Milo Radulovich during the American Red Scare. Simone Simon plays Serbian-born fashion designer, Irena Dubrovna, in the Cat People (1942 film). She also appears in The Curse of the Cat People, a 1944 sequel to The Cat People. Philip Dorn plays Draža Mihailović in the 1943 Hollywood film Chetniks! The Fighting Guerrillas. Video game GTA IV includes Serbian characters. Diplomatic Siege (1999), American action film, features Serbian kidnappers demanding the release of a war criminal. Saint Petka Serbian Orthodox Church Yugoslav Americans. ^ The community is commonly known in English as "Serbian Americans", and scarcer as "Serb Americans". In Serbian, the community is known as "American Serbs" (Амерички Срби/Američki Srbi), and scarcer as "Serbs in America" (Срби у Америци/Srbi u Americi). ^ "2012 American Community Survey". Factfinder2.census.gov. Retrieved 7 October 2017. ^ a b c d e f Powell 2005, p. 267. ^ Dorich, William. "Who Are the Serbs?" World Affairs Council of Orange County. California, Irvine. 1995. Speech. ^ Durniak, Gregory, Constance Tarasar, and John H. Erickson. Orthodox America: 1794-1976: Development of the Orthodox Church in America. New York: Orthodox Church in America. Department of History and Archives, 1975. Print. 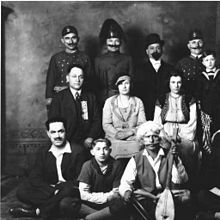 ^ Vujnovich, Milos M. Yugoslavs in Louisiana. Gretna: Pelican, 1974. Print. ^ a b Henderson & Olasiji 1995, p. 124. ^ a b c Alter 2013, p. 1257. ^ ""The History of the St Nicholas Church." St. Nicholas Russian Orthodox Church - Home. Orthodox Church in America". Stnicholasjuneau.org. Retrieved 10 June 2017. ^ Archer, Laurel. Northern British Columbia Canoe Trips. Surrey, B.C. : Rocky Mountain, 2010. Print. ^ Arnold, Kathleen R. "The Mining Frontier and Other Migrations." Contemporary Immigration in America a State-by-state Encyclopedia. Santa Barbara, CA: Greenwood, an Imprint of ABC-CLIO, LLC, 2015. 28-29. Print. ^ Blagojević 2005, p. 30. ^ Rodney P. Carlisle; Joe H. Kirchberger (1 January 2009). World War I. Infobase Publishing. pp. 11–. ISBN 978-1-4381-0889-6. ^ Bock-Luna 2005, p. 25. ^ Serbian Studies. 4–5. North American Society for Serbian Studies. 1986. p. 19. ^ Serb World. 5–6. Neven Publishing Corporation. 1988. p. 40. ^ Powell 2005, pp. 267-268. ^ Paul 2002, p. 94. ^ "The History of the St Nicholas Church." St. Nicholas Russian Orthodox Church - Home. Orthodox Church in America, n.d. Web. 10 June 2017. ^ Nicolson, Mary C.; Slemmons, Mary Anne (1998). Alaska Newspapers On Microfilm, 1866-1998. Fairbanks/ Juneau: University of Alaska Fairbanks/ Alaska State Library. pp. 63–64. ^ Kelly, Sheila. 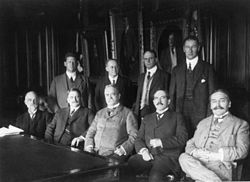 "Labor Troubles and the Western Federation of Miners." Treadwell Gold: An Alaska Saga of Riches and Ruin. Fairbanks: U of Alaska, 2010. 143. Print. ^ Kelly, Sheila. "Tough Grind of the Hard-Rock Miner." Treadwell Gold: An Alaska Saga of Riches and Ruin. Fairbanks: U of Alaska, 2010. 110. Print. ^ Ferguson, Judy. "Interior Immigrants: From a Tiny Country to the Great Land." Heartland Magazine 21 Mar. 1999: n. pag. Print. ^ "Man from Belgrade Earned Serbian Annual Salary in Alaska in 55 Days." Telegraf.rs. N.p., 5 Jan. 2017. Web. 12 June 2017. ^ "[SNN] Serbian Americans savor the good times, each other". Mail-archive.com. Retrieved 7 October 2017. ^ "Performing Arts CT: Live Theater Shows - Hartford Stage". Hartfordstage.org. Retrieved 7 October 2017. ^ "Serb is Inventor of the Year in Illinois, UIC OTM Announces 2010 Inventor of the Year". Usaserbs.net. Archived from the original on 26 April 2012. Retrieved 7 October 2017. ^ Knezev, Sasha. "Official Website". 888films. Alter, Peter T. (2013). "Serbs and Serbian Americans, 1940-present". In Barkan, Elliott Robert (ed.). Immigrants in American History: Arrival, Adaptation, and Integration. Santa Barbara, California: ABC-CLIO, LLC. pp. 1, 257–1, 263. ISBN 978-1-59884-220-3. Susan Auerbach (1994). "Serbian Americans". Encyclopedia of Multiculturalism: Names and name changes-Six Nations. Marshall Cavendish. ISBN 978-1-85435-675-8. Blagojević, Gordana (2005). Срби у Калифорнији: обредно-религијска пракса и етницитет верника српскикх православникх парокхија у Калифорнији. Etnografski institut SANU. ISBN 978-86-7587-033-3. Bock-Luna, Birgit (2005). The Past in Exile: Serbian Long-distance Nationalism and Identity in the Wake of the Third Balkan War. Berlin, Germany: LIT Verlag Münster. ISBN 978-3-8258-9752-9. Henderson, George; Olasiji, Thompson Dele (1995). Migrants, Immigrants, and Slaves: Racial and Ethnic Groups in America. Lanham, Maryland: University Press of America. ISBN 0-8191-9738-6. Kosier, Ljubomir Stefan (1926). Srbi, hrvati i slovenci u Americi: ekonomsko-socijalni problemi emigracije. b.i. Lopušina, Marko; Lopušina, Dušan (14 October 2013). Srbi u Americi. Agencija TEA BOOKS. ISBN 978-86-6329-097-6. Marković, Luka (1975). Borba u iseljeništvu za novu Jugoslaviju. Izdavački centar Komunist. Pejović, Luka M. (1934). Život i rad američkih Srba. Paul, Rachel (2002). "Serbian-American Mobilization and Lobbying: The Relevance of Jasenovac and Kosovo to Contemporary Grassroots Efforts in the United States". In Ambrosio, Thomas (ed.). Ethnic Identity Groups and United States Foreign Policy. Westport, CT.: Greenwood Publishing Group. ISBN 0-275-97532-0. Powell, John (2005). Encyclopedia of North American Immigration. Infobase Publishing. Slepčević, Pero (1917). Srbi u Americi: Beleške o njihovu stanju, radu i nacionalnoj vrednosti. Ujedinjenja. Šotra-Gaćinović, Milena (1990). Viđenja iz iseljeničkog života u Americi. Vojnoizdavački i novinski centar. Vidaković-Petrov, Krinka (2007). Срби у Америци и њихова периодика. In-t za književnost i umetnost.